Engineers have always been known to conceptualize, design and build things. Now, the final part of that process has become is more convenient. 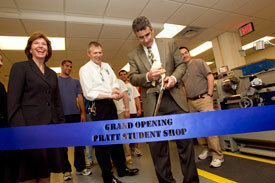 After being located in several locations over the past few years, Pratt’s student shop is now closer to the engineering quad, and bigger and better than before. The new shop, with four rooms equipped with specific machines and tools, is open for business, located in the basement of the Telcom Building, accessible from the loading dock. “The layout is much more spacious, so students should find it easier to work on their projects without effecting students next to them,” said Steve Earp, shop director who organized the move from to the current locations from the Coal Pile building. “The old location was pretty tight, so we were always moving things around to accommodate different projects. The largest of the four rooms not only contains most of the metal working machines – drill presses, millers, lathes and benders – but has spacious areas equipped with computer terminals and work tables. There are separate rooms for the universal laser, wood working machines, and one for what has been affectionately referred to as the big green monster, or electrical discharge machine, which cuts metal just as a laser cuts plastic. The machine shop experience is not only limited to its new physical location. There is a website that covers all aspects of the shop as well as scheduling, and a series of video tutorials on YouTube about the different machines. Each video is a three-minute easy-to-understand description of how to perform a single operation on a particular machine. So far, the site has already had more than 22,000 viewers, including students in university engineering shops across the country. These videos are also portable. The Duke Center for Instructional Technology donated three iPads to the machine shop that allow students to view the tutorials while actually working at the machine. “Steve has worked tirelessly to make this facility a reality,” said Pratt Dean Tom Katsouleas at the recent ribbon-cutting ceremony. “He organized the logistics of the move – the second in his short time here – and also has negotiated, bargained, cajoled and scoured the landscape for equipment to give our students the best possible experience.